RunSwitch PR has been named one of Kentucky’s “Best Places to Work” by the Kentucky Chamber of Commerce. The statewide award adds to RunSwitch’s other workplace awards, including being a two-time winner of Louisville’s Business First“Best Places to Work” award. The prestigious award is based on employee responses to a survey conducted by the Kentucky Chamber. A full list of this year’s winners can be found here. The final rankings will be revealed at an awards dinner on April 23, 2019. RunSwitch PR is a full-service communications firm providing a range of services including public affairs, public relations, and political consulting to an impressive list of local, national, and international clients. 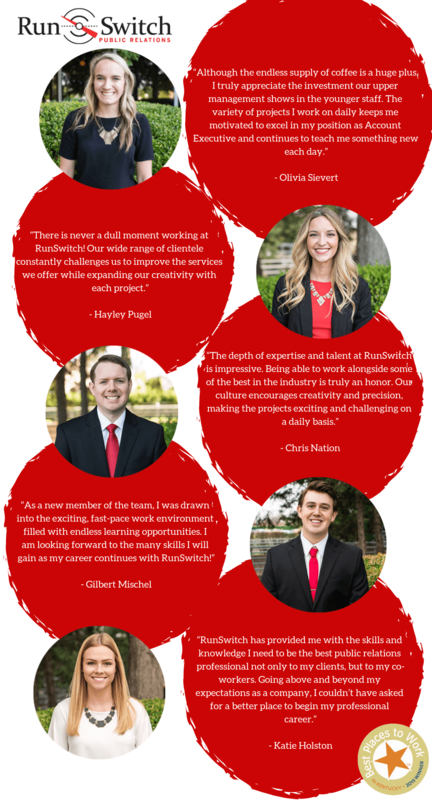 RunSwitch has long been recognized as the state’s largest and most successful PR firm and a Best Places to Work award winner by both Louisville’s Business First and Kentucky Chamber. For more information about RunSwitch PR and its team, visit www.runswitchpr.com or follow the firm on Twitter and Facebook.